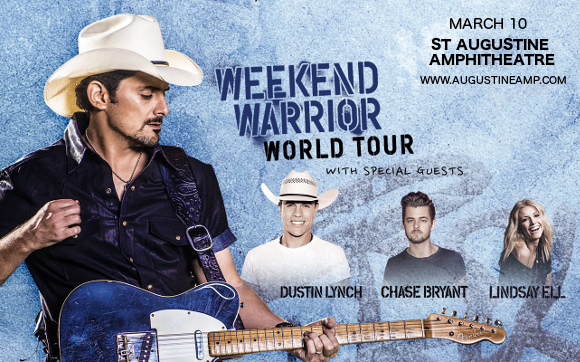 If you missed Brad Paisley on his Weekend Warrior tour with Dustin Lynch, Chase Bryant & Lindsay Ell in 2017, you’re in luck!! The crew are reuniting for another run in 2018, giving you the chance to catch all these phenomenal country acts live in one amazing show! Just head on down to the St Augustine Amphitheatre on Saturday 10th March 2018 – book your tickets NOW for your chance you be there! Get ready to see this country phenomenon live – get your tickets NOW!